The 2019 Toyota Tacoma is here, and it is not holding anything back. This new model has the off-road capability you need while keeping the impressive performance that you want to handle your weekend adventures and your everyday commute. Shoppers will have the choice between six different trim levels when it comes to the 2019 Tacoma. These trim levels consist of the SR, SR5, TRD Sport, TRD Off-Road, Limited and TRD Pro. Each of these models offers a different set of standard features and starts a different price to offer an option for every driver. With the impressive options to choose from and the dependability of it being a Toyota, it is hard to go wrong with a Tacoma. 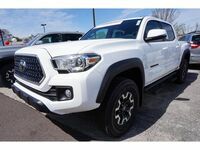 Drivers can easily find a 2019 Tacoma that fits their style by choosing between nine different exterior colors. Continue reading to learn about some of the highlight features the new Tacoma has to offer or click on the button below to view our current inventory. As we mentioned above, the 2019 Tacoma has the off-road capability to get you where you need to go. The Bilstein® Shocks, electronically locking rear differential, Multi-terrain Select, Crawl Control and Hill Start Assist Control all work together to handle whatever terrain you come across. Since the 2019 Tacoma is built with high-strength steel to ensure the toughness that you would expect from your truck. Toyota knows that you have extra toys that you would like to tow along with you on your next adventure so they made sure that the Tacoma could handle it. The available 3.5-liter V6 DOHC engine provides 278 horsepower and 265 lb-ft of torque. This engine paired with the available Tow Package can tow up to 6,800 pounds or carry a payload of 1,440 pounds. Also included in the Tow Package is the Trailer-Sway Control (TSC) feature. The tough and rugged exterior has plenty of features on the interior too such as the Qi-compatible wireless smartphone charging station, the integrated backup camera and much more. There is plenty more to explore with the 2019 Tacoma. Click on the button below to receive more information or stop by the dealership today.